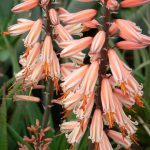 Sue and Ian Burden joined the Sunbird Aloes family in 2011 and they now grow a large selection of Sunbird Aloes cultivars. Their wholesale nursery lies on a farm off the N6 between East London and Stutterheim. It is not open to the public but Sue would love to show garden enthusiasts, clubs/associations and landscapers around the nursery where many of the larger varieties are now coming into their own. Please phone for an appointment as Sue has her own landscaping business that takes her away from home most of the time.Sue also supplies retail nurseries. Sue takes her plants to market days in the region (like “The Farmers Market at PineCreek, East London, Avalon Market at Kidd’s Beach and Stutterheim Farmers craft and art Market). 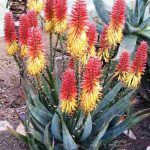 These are good opportunities for gardeners and indigenous enthusiasts to get their hands on some of these sought after aloes. 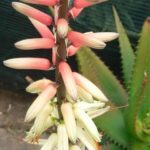 For further events around the Eastern Cape (Port Alfred, Graaff-Reinet and an Open Day are on the agenda) please keep an eye on the news items on the home page of this website.